12-16 Brunswick Street, Glasgow. G1 1TD. It's very sad to see this old favourite pub closed down and in a state of demolition. 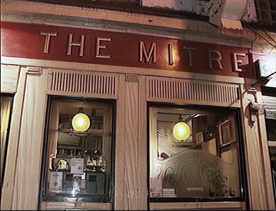 Well known publican James Halliday opened the Mitre Bar in 1927. Mr Halliday was granted a licence on 13th April 1927, paying an annul rent £85. The Mitre Bar was formerly occupied by Watson & Company, Bakers Utensil Makers and shop outfitters and is not a very old pub compared with other public houses in the Merchant City at that time. 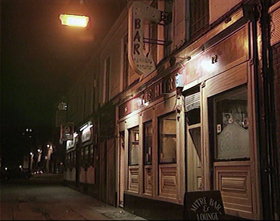 The Mitre Bar at night. Mr James Halliday was an experienced publican in town he had premises at 6 Brunswick Street, this old pub dated back to the 1840s before they were demolished in 1927, Cantor’s furniture store then occupied the site. Mr Halliday was then granted a licence for new premises a few door down at number 12 Brunswick Street. 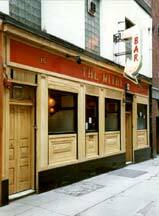 Angus McBain then took over the Mitre Bar from the 1930s, which stayed in the family until 1963. When Mr McBain died his wife took over the licence, their two sons Sandy and George helped to work in the pub when it got busy. In 1959 the pub was extended upwards the floor above the pub was turned into a new cocktail bar and lounge. One of the oldest customers Mrs C B Barclay performed the opening ceremony by cutting the tape. Tom Lavelle a well known golfer in the licensed trade was manager, he worked for the McBain family for many years and previously worked for Mr Halliday. The interior of the new cocktail lounge was very brightly decorated, with blue star Formica tables which matched the bar counter. Drofilco, mahogany and obeche paneling had been used throughout. Orange strip lighting behind the bar gave a warm glow, concealed lighting was used in the canopy over the bar and concealed strip lighting was used behind the blue wall seating. Mrs E McBain the owner of the Mitre Bar with her two sons George and Sandy on the left and Mr T Lavelle the manager on the right. The photograph above was taken at the opening of the new cocktail bar and lounge upstairs in 1959. 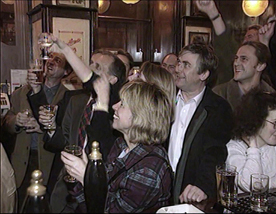 George Hogg then took over; he ran the pub for over ten years. In 1991 the pub was taken over by Kevin and brother Gerry Febers, the pub now lies empty in a derelict state, minus the old neon sign. Customers watching a football match on T.V. The Evening Times did a feature on the Mitre Bar in 1995 on the run up to Scottish pub week, they mentioned a date of 1866 which of course is just fabrication. 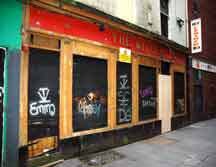 What a shame to see this once very popular bar in a state, with graffiti all over the frontage. A small of strong urine and alcohol takes the breath away from you. 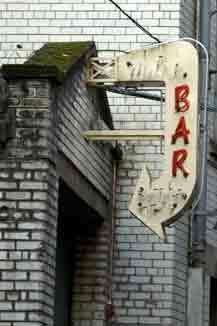 Mitre Bar's neon sign still survives on a wall in Tontine Lane off the Trongate. 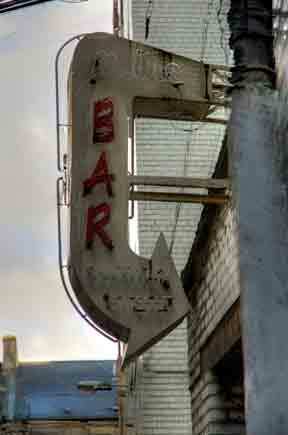 Mitre Bar's neon sign. 2009. Another old tavern in Brunswick Street is the Fox and Hound formerly known as the Angus Bar and Reid's. James Denholm once own it in the 1940s. On the other side of the street at 33 Brunswick Street The Prince of Wales Tavern stood in the early 19th century as was the old tavern the Lord Clyde.